Sunshine State politics are one hot mess. The first thing you need to understand about Florida's political climate is that its seemingly endless summer of Boom Times seems to be coming to a close. The vast migration to the state that caused its population to increase over 16 percent since the 2000 census seems to be winding down, and last year, shockingly enough, it actually lost population. The state's economy is suffering from problems that are deeper than any business cycle: Its 2.7 percent drop in per capita personal income has pushed the state near the bottom of rankings by percent change of personal income data. State government and politics have followed suit, inaugurating a period of unhappy partisan and ideological wrangling with no clear outcome in sight. In addition, Florida has certainly suffered from the global economic slump because it is a major magnet for foreign investment. It also shares some of the structural problems of its otherwise very different Southern neighbors, particularly chronic underinvestment in public education. And when it comes to the fiscal and political consequences of a bad economy, Florida is one of just a handful of states with no personal income tax, which has made property-tax rates on steadily decreasing real estate values a red-hot issue (a billion-dollar deal that allowed the Seminole Indian tribe to expand its gambling operations was one of the only things that allowed legislators to balance the latest state budget). So the question is, what does this mean for Charlie Crist, the erratic and heavily-tanned governor who is throwing the calculations of both major political parties into chaos? And what does it mean for Democrats, whose electoral future continues to depend, in part, on the whims of Florida's diverse and fickle voters? Still, Crist was enough of a big deal in Republican circles that when he decided to run for Senate, the National Republican Senatorial Committee endorsed him, and few were willing to bet that conservative rival Marco Rubio had much of a chance to beat him. It’s pretty safe to say that Crist has lost ground consistently since he announced his run, as conservatives across Florida and the country have flocked to support Rubio, a Tea Party favorite who’s also something of a protégé of former Governor Jeb Bush. Crist plotted a deep-pocketed comeback, hoping to drive up Rubio’s negatives by drawing attention to the former Florida House speaker’s involvement in a burgeoning scandal, which revolved around the state Republican Party giving its legislative poohbahs credit cards that they used for lavish non-party-related expenses. But despite hurting Rubio, nothing seemed to boost Crist himself, and rumors began to circulate that he might pull out of the primary and refile as an independent candidate in the general election (which he could still do as late as April 30). In a deep and growing hole according to every poll of the Senate primary, Crist pretty much blew up his Republican political career by vetoing, on April 15, a bill to institute a controversial “merit pay” system for teachers. (The bill would have phased out teacher tenure and made half the value of annual teacher evaluations strictly dependent on the students' standardized test scores, an approach that goes far beyond most “pay-for-performance” proposals in other states.) Recently, support for the bill had become something of a Republican litmus test—as well as the source of a holy war between conservatives and teachers’ unions—and the proposal was particularly close to the heart of one Jeb Bush. 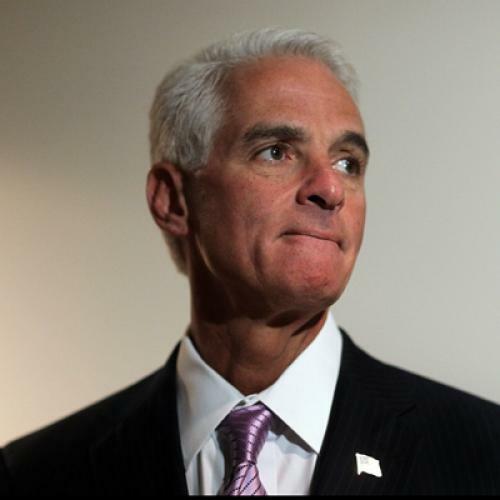 Crist's campaign chairman, former Senator Connie Mack, promptly resigned. Crist probably took the popular position on “merit pay,” which had provoked protests and marches by teachers, students, and parents all over the state. And, as it happened, a new Quinnipiac poll came out the very day of the veto showing Crist running first in a hypothetical three-way race against Rubio and Democrat Kendrick Meek. So, even as Crist left Floridians hanging right up until the very end on his intentions toward the “merit pay” bill, he may now keep them guessing until April 30 about his current party affiliation. With so much media attention focused on the ascendancy of Rubio and the Tea Partiers within the Florida Republican Party, it's easy to forget that the state has a general electorate which isn't necessarily so conservative. Indeed, the same Quinnipiac poll that showed Crist ahead in a three-way race showed Rubio’s lead over Democrat Kendrick Meek in a two-way race dropping to a mere 4 percent. Could it be that the foreordained GOP victory in the Senate race—not to mention the much-speculated Marco Rubio ascent to the vice presidency or higher—is in a bit of trouble? Florida's predicted stampede into the red state column may very well be stalled, which could have important ramifications for 2012. That's not to say that there aren't indicators which point in the other direction as well. Florida was the definitive "purple state" in 2000, and Barack Obama carried it narrowly in 2008. But, historically, Florida went Republican in eight of the ten presidential elections prior to 2008. The last successful Democratic gubernatorial candidate was the late Lawton Chiles in 1994, a victory over Jeb Bush that fatefully elevated George W. as the scion of the Bush dynasty. And Chiles is also just one of three Democrats—the others are the very rich and successful Governor Bob Graham, and the former astronaut and longtime elected official Bill Nelson—who have won Senate elections in Florida during the last 30 years. Moreover, Florida is a state where Republicans have a large built-in advantage in midterm elections, particularly now. Barack Obama carried Florida in 2008 with a historic surge in minority voting levels, particularly by winning the Hispanic vote by a 57 percent to 42 percent margin (John Kerry won only 44 percent of the Hispanic vote in 2004). Yet even as he carried under-30 voters with 61 percent, Obama lost Florida seniors to McCain by a margin of 53 percent to 45 percent. (Voters 65 and older make up nearly one-quarter of the Florida electorate, about 5 points higher than their national share.) Since white seniors are the demographic category most likely to participate in midterm elections, and the youngest voters are the least likely, it’s not surprising that Republicans have the high ground this year. And, given the importance to Florida Democrats of posting a strong performance among Latinos, it’s significant that Marco Rubio, who hails from South Florida’s conservative Cuban-American community, is not terribly popular among Latinos statewide. His vocal opposition to comprehensive immigration reform, which delights conservatives who can claim solidarity with him in the fight against “amnesty,” probably doesn’t go over well with the growing Latino bloc in Central Florida, which is mostly Puerto Rican. This is one reason that Rubio isn’t doing so impressively in general-election trial heats against Kendrick Meek, an African American with his own close ties to South Florida's Cuban-Americans. If Rubio goes down in either a two-way or three-way contest, the highly problematic relationship between the GOP and Latino voters will have room to re-emerge in a way that helps Democrats nationwide. With George W. Bush at his new house in Dallas for good; John McCain running away from his own longtime championship of comprehensive immigration reform; and no one like Rubio to provide “cover,” conservative demands for a tough line on immigration will may again bubble up in a way that tarnishes the Republican brand. Meanwhile, the Senate fireworks in Florida have overshadowed the race to succeed Crist as governor, which is arguably a much bigger deal in terms of the future of Florida politics. It’s important to remember that the decennial redistricting of congressional and state legislative districts is coming up next year. Florida’s maps currently reflect a heavy-handed Republican gerrymandering effort during the last redistricting. With the legislature sure to remain in GOP hands this year, the election of a Democratic governor could have an impact on the way the new districts are drawn. In the early days of this election cycle, Democrats were very excited about their likely gubernatorial candidate, Alex Sink, who is Florida’s elected chief financial officer and their only statewide officeholder other than U.S. Senator Bill Nelson. As a female Democrat with extensive business experience, she seemed tailor-fit for Florida; and it didn’t hurt that her husband is wealthy trial lawyer Bill McBride, best known for beating Janet Reno in the 2002 Democratic gubernatorial nomination before losing to Jeb Bush. (I attended a Florida Democrats' event that she appeared in 2007, and when Sink entered the room, people practically bowed and scraped.) Moreover, her likely Republican opponent, former congressman and current attorney general Bill McCollum, was considered less than a political fireball, having lost Senate elections in 2000 and 2004 after compiling a controversially conservative record over 20 years in Congress. (For example, he voted against the MLK holiday and the Family and Medical Leave Act.) McCollum was also coming off a less-than-successful stint as Rudy Guiliani’s Florida campaign chairman. Then, Sink and the Democrats ran into some rough patches as the campaign neared. For one thing, as the financial crisis continued to take its toll on Florida, Sink’s tenure as Bank of America's Florida operations director turned her financial acumen from an advantage into a big handicap, particularly when her former boss, BoA Chairman Ken Lewis, was indicted in New York. (None of Sink's own work for the bank was in question in this indictment, and she is protected somewhat by the fact that McCollum was once a lobbyist for the financial industry.) McCollum also got a small boost out of the multi-state lawsuit that he and other Republican attorneys-general have launched against federal health reform legislation (although voters seem to have since flipped on the issue), and the failure of his main primary rival, state Senator Paula Dockery, to get any traction. But even as Florida political junkies were riveted by Crist’s Hamlet act on “merit pay,” McCollum got some bad news: Wealthy former hospital executive Rick Scott, whose Conservatives for Patients Rights group played a prominent national role in the fight against health reform, has leapt into the governors race, with a big wallet. Scott seems to be horning in Rubio voters and attempting to identify McCollum with Crist as another status quo politician, which is a pretty rich vein to mine. Sink may have a couple of other aces up her sleeve, beyond McCollum's primary troubles. For one thing, she’s been vocally against the “teacher merit pay” bill from the get-go, which is the popular position to take according to polls. Moreover, when her poll numbers lagged early on, they may have disguised a hidden strength: Because many Florida women likely don't realize that "Alex" is female, she should benefit from an increased "gender gap" as they realize who she is during the course of the campaign. A Quinnipiac poll also showed Sink significantly cutting McCollum’s lead all the way down to four points, with a big undecided vote. In short, the conventional wisdom about Sunshine State politics could well be wrong. In addition to those I've outlined above, there are at least three highly competitive U.S. House races and plenty of vicious state legislative races. Perhaps 2010 will ultimately be remembered as the year that Marco Rubio and his Tea Party allies slew the hated RINOs and led a conservative resurgence, extending the True Faith further among Latino voters. But, as with Florida’s economy and its demographics, events could take a very different turn than expected, very fast, and nothing would enthuse Democrats nationwide much more than keeping Florida purple and in play for 2012. Ed Kilgore is a special correspondent for The New Republic. He is also managing editor of The Democratic Strategist and a senior fellow at the Progressive Policy Institute.